Personalized Scarf Printed To Order. Make Your Own Scarf. No minimum. Take your style into your own hands and make your own printed scarves. These beautifully custom printed scarves are light, airy and silky to the touch. Your new chic personalized scarf is available in 4 different sizes, 5 elegant customized fabrics, and 2 hemming options. Choose from Silk Sensation, Real Silk Satin, Mulmul Muslin, Silk Georgette or Paris Chiffon. Every scarf is handmade to order, using your photos or designs. Select the perfect size for your requirements, and create an accessory that you can wear and treasure forever. No minimum. Design your own scarf and create the perfect fashion accessory. They keep you warm, while looking ultra stylish. They can turn a plain and relatively simple outfit into something a lot more fashion forward. Instead of choosing a generic scarf from the high street, why not design your own scarf? With Bags of Love, you can choose from 5 gorgeous fabrics, both man made and natural; Silk Sensation, Mulmul Muslin, Paris Chiffon, Real Silk Satin and Silk Georgette. Each has its own unique qualities and bespoke attributes. You can also select from 4 different sizes; 35.43" x 35.43", 53.15" x 12.2", 52.36" x 41.33" and 45.27" x 45.27". To take the customization to the next level, there are 2 hemming options; baby hem and 3 thread overlock. Every scarf is handmade to order in the Bags of Love studio by our team of expert technicians and seamstresses. Give your accessory collection a boost and design your own printed scarves today. I am thrilled with the quality of the real silk scarf with rolled hem edges! I sold the painting but still have the art on something lovely I can wear. I was delighted with my experience. My scarf was produced beautifully in a timely manner. This project means quite a lot to me. The image is of one of my paintings and the first scarf produced which will soon be a product line of many of my paintings on scarves. Liked the scarf but I would have liked to have seen the other side in a "Preview" so I would have known the flip side was white. Can I get one made with the image on both sides? The color is spot on and I was so impressed that I could input the actual color formula so that red/orange is true to my company's logo. The quality is excellent as well! What Will My Printed Scarves Look Like? When you make your own scarf with Bags of Love, you have the ability to make it look however you want. Choose your favorite fabric from 5 chic options. From real silk to snuggly soft muslin, there is a fabric fit for every purpose. Your personalized scarf also comes in a range of sizes and hemming options. Go for a large, square shape to create fashion forward looks, or for a longer and slimmer version to enjoy wrapping it around your neck. Every scarf is handmade to order by our team of skilled craftsmen. From print, to cutting, to hemming, there isn't one step in the process that is mass produced. We offer 2 hem types for your scarf. Baby hem uses 0.32" of material on each side, folded twice then a top stitch approximately 0.08"- 0.12" from the edge. The 3 thread overlock trims off 0.12" fabric, and has an overlock edge stitch. 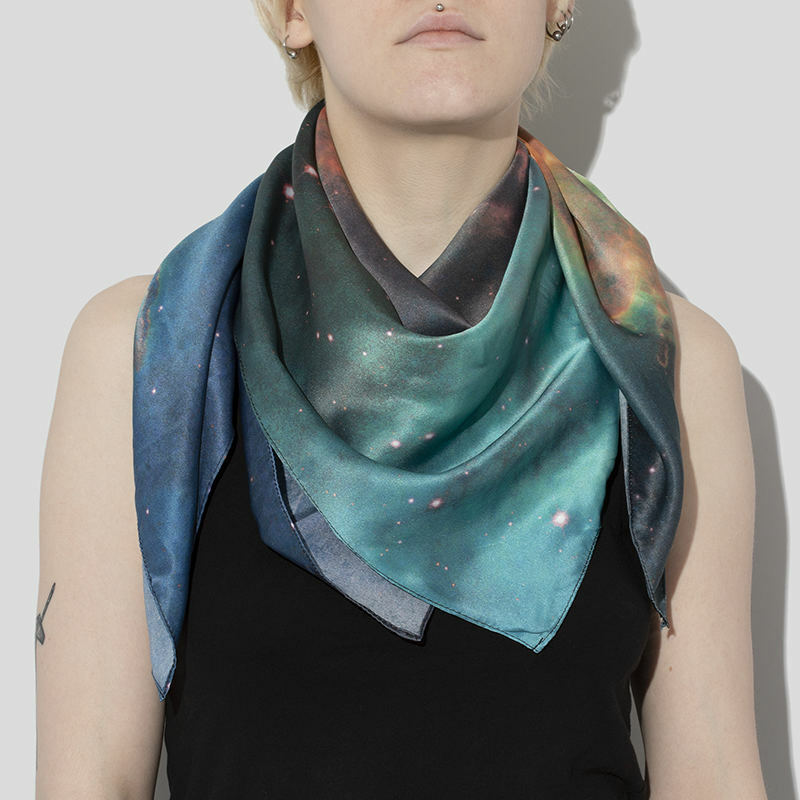 Photos and designs will look simply stunning when printed onto your scarf. A unique and cutting edge accessory, that is a guaranteed gift winner! We have no minimum order amount with our scarves, however, when you buy more, you save more. Treat yourself to a gorgeous handmade scarf and save money when you buy a second. Please get in touch with our customer service team for more information about our quantity discounts. Every photo scarf has no minimum order amount and is handmade to order by our team of skilled craftsmen. From print, to cutting, to hemming, there isn't one step in the process that is mass produced. We offer 2 hem types for your scarf. Baby hem uses 0.31" of material on each side, folded twice then a top stitch approximately 0.08" -0.12" from the edge. The 3 thread overlock trims off 0.12" fabric, and has an overlock edge stitch. Please note: As all of our scarves are handmade to order, there will be some variance in the dimensions of the scarf. A predictable amount of shrinkage is likely to occur, this is normal and to be expected, and will be more apparent in the natural fabrics. Due to the delicate nature of the MulMul Soft Music fabric, some pulls are to be expected and this is not out of the ordinary. When you create your own scarf, it is important to consider which fabric you want to use for your printed scarves. Each fabric has different qualities, that make them unique. Our gorgeous silk fabrics are 100% natural, so no chemicals have been used on the fibers. Due to our specialist printing method, you will receive prints that have intense colors. You could also opt for one of our poly blend fabrics, which are printed using a slightly different method and results in rich colors. If opting for the natural silk options, please note that the grain of the fabric can result in a slightly wavy edge, apparent on 2 sides of the hemmed fabric. This is due to the natural softness of the silk and its beautiful, delicate nature. The edges can be wavy, and this is to be expected, especially on the Georgette. Your scarf will be super soft to the touch, have amazing show through quality, and the print will be permanent. Please note: If opting for Mulmul Muslin, please note that this fabric has a naturally loose yarn, which can help give designs a slight rustic aesthetic. This does not in anyway impact the quality of the print, and merely adds to the natural charming qualities of the fabric. As Mulmul has quite loose yarns, you might find that there are slight color and intensity variations. This would be apparent in parts where the tread is looser. We believe this natural attribute helps give designs a gorgeous, almost vintage finish. Our Personalized Bomber Jacket for men is a bespoke piece designed with your photos or designs. Hand made.